UK parents may not be putting their first preference on primary school application forms because they do not expect to get a place, research says. Researchers at London University's Institute of Education asked parents if they would have liked to apply to a different school, but did not. They found that between 4% and 7% of parents who got their first choice school had preferred another school. The government said nearly nine out of 10 parents got their first choice. 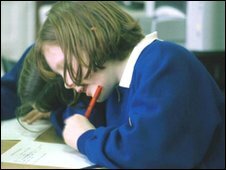 The study by the Institute of Education was based on the Millennium Cohort Study of 15,000 UK children. Some 94% of families who applied for a place at a state primary school in England won a place at their chosen school, according to an examination of school choices made by parents taking part in the study. In Wales, Northern Ireland and Scotland this proportion was 98%. But if their findings were taken into account, the researchers said, it meant that 88% of parents in England, 92% in Wales, 95% in Northern Ireland and 91% in Scotland actually had children attending their first preference of school. "One explanation for the fact that the vast majority of pupils attend their first choice school is that their parents selected a school that they were very likely to get into," the researcher said. "For instance, parents may have opted not to put a school that they preferred at the top of their choice list because they felt that their child had a low probability of getting into it due to over-subscription. "If parents act fatalistically and do not make ambitious choices, this would explain why most do get their first choice." The researchers were also able to establish which parents taking part in the Millennium Cohort Study were more likely to secure their first choice primary school. In England, mothers with at least a degree were marginally less likely to achieve their first choice (87.2%) than mothers with fewer than five higher-grade GCSEs (93.7%). "This could, of course, reflect the fact that university-educated parents are more likely to choose a higher-performing, over-subscribed school," the researchers said. Children's Minister Dawn Primarolo said: "There is no reason for any parent to try for their second best school because they feel they won't get their first choice. "Schools cannot judge based on whether they were put first or not and parents can put at least three choices, meaning they don't have to choose between the school they really want and the school they think they have the best chance of getting. "The overall picture on school choice is very positive - even based on the Millennium Cohort researchers' own figures, nearly nine out of 10 parents are getting their first choice primary school."